Apol of La Pomme creates the most precious things - her imagination is magical and the fact that she does it all from a small village in France makes it all the more endearing! Oh and did I mention she works out of a small mobile home she installed next to her garden, after growing tired of working on top of her dining room table! 1. Deciding to make a bird: Took one afternoon. I live in the Camargue, in France. It’s a nature reserve, and one day while staring at the flamingos and herons feeding in front of my home and listening to the squawking of seagulls and other feathered creatures, I decided I was going to make myself a bird plush. 2. Letting the idea boil in my neuron soup: Months and months, meanwhile I grow fabric fruits and flowers. 3. The A-ha! moment: Took just, uhm, a moment, when I happened upon a picture of swans while doing research on plants to add to my dry garden. 4. Making the pattern: 10 to 15 minutes. I’m pretty quick at this. 6. Stuffing the bird: (With polyfill herbs and potatoes--yum!.) Takes another 10 minutes. 8. Deciding on the final touches: Hand-embroidery? What stitches to use? What color of thread? Just the wings or all over the body? Buttons for the eyes? This can go on for a long time! 9. Letting it sit in my workroom: Overnight. The day after, I take a good long look and decide if I’m happy with it. If not, I poke the poor thing with a needle some more. Make sure to check out La Pomme where you can buy one of these lovely swans and be sure to stop by lapommeblogs.blogspot.com to say hi! Sorry to gush, but: I love it!!! Thank you for making sure it looked good, Marichelle. You're a sweetheart! Wow, this is such a beautiful piece!! So magical. 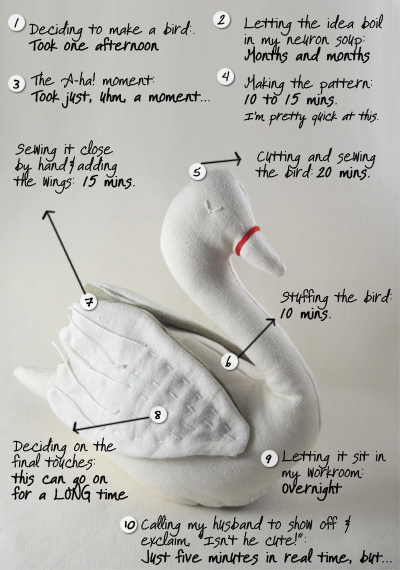 Ooh...I love this sweet little swan and love Apol's shop. This is a lovely interview and such sweet answers! Another great reason to visit France! Apol: I don't think it's even possible to make your creations look bad! littlellama, Leina, Connie and Melissa - completely agree, she's one talented lady! Oh and please be on the lookout for a more in depth Apol interview/feature (in a few weeks).